Build a parlor table that is sure to become an heirloom. 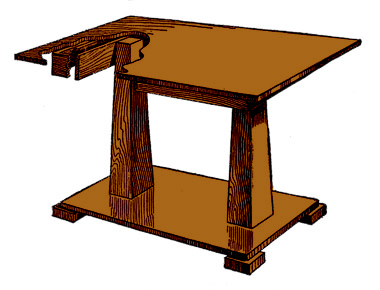 Click here for detailed parlor table plans. 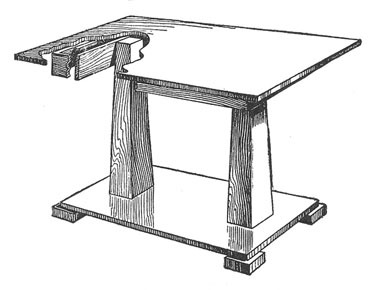 1 table top, 1 by 26 by 41 in. 1 bottom shelf, 1 by 15 by 35 in. 2 side rails, ¾ by 4 by 33 in. 2 end rails, ¾ by 4 by 21 in. 2 top cross braces, 1 by 4 by 19½ in. 4 feet, 1¾ by 4 by 4 in. 2 posts, 6 by 6 by 26 in. 2 side corner strips, 1 by 1 by 31½ in. 2 end corner strips, 1 by 1 by 17½ in. The bottom shelf can be made of two pieces of 1-in. material, 8 in. wide, carefully glued together, and reinforced on the underside with two crosspieces, glued and screwed to it. The foot pieces are secured to the bottom shelf so as to project 1 in. on the ends and sides. In case a center support is deemed advisable, another foot piece can be added, but unless the floor is very level, rocking may result. The uprights, or posts, are made from solid 6 by 6-in. lumber, 26 in. long, carefully squared at the ends, and tapered to 4 in. square at the upper end. If desired, the posts can be made of boards, cut and fastened together to form a hollow tapered post. In either case, they should be set in about 4 in. should be cut and fitted with mitered joints at the corner to form a rectangular frame, 21 by 33 in. This is glued to the top and may be toenailed to it ; but to provide a more secure bracing, a 1-in. square strip of material is fastened all around the inside edge of the rails, flush with their upper edge. The top is screwed to this. In order to prevent tipping when the top is resting on the 4 by 4-in. ends of the posts, two cross braces are provided. These should be screwed to the outer-end sides of the posts, and beveled off on their upper edges to fit the table top. They should be of such length as to have a tight fit between the side rails, and are fastened to these by means of finishing nails driven from the outside. Gluing and toenailing can also be used to secure the top more firmly to the braces; care should be taken that no nails cut through the table top. After thoroughly sandpapering and smoothing off the table, it can be finished to suit.